For the 41st running of the toughest race on earth, Black Falcon, the privately owned local team from Meuspath took on the world’s biggest racing teams and Won! A monumental achievement for all those involved, in some of the most difficult racing conditions imaginable. What a difference one year can make. 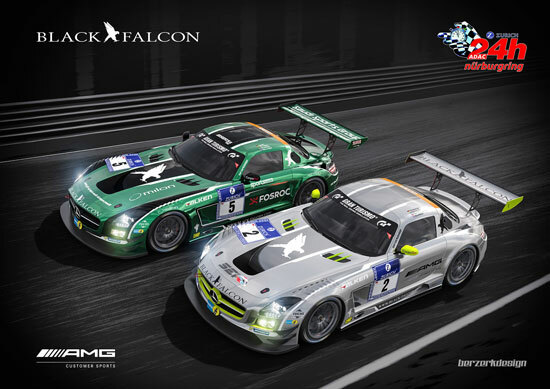 In May 2012, the Black Falcon team started the 24 Hour race at Nürburgring with high hopes of victory. Having qualified in 3rd position, the team tasted bitter disappointment after the car was crashed following a high-speed tyre puncture on the fourth lap. Now one year later, that bitterness has been replaced by the sweet taste of success. A whole year in planning. Is what it took from the entire team including all the partners, drivers, team members and sponsors. With three SLS AMG GT3’s and two Porsche cup cars entered, the build up to this race, left the team with no time to spare. The start of the racing season was blighted by poor weather. Heavy snow and freezing conditions meant the first race and test days were cancelled. Leaving little time and fewer opportunities to make the final set up and preparation for the cars. With two test days and two VLN races, the team worked alongside their partners: Dunlop, Bilstein, Pagid and AMG, to get the best working combination of tyres, dampers, brakes and chassis, to produce the number one performing car in the field. With this combined effort and many late nights the Black Falcon team worked tirelessly to have all the cars ready to go for the 24 our race. For the 2013 entry, Black Falcon entered with car number 9, one of the strongest driver combinations in the field. Five times DTM champion and one of the living legends of Motor racing, Bernd Schneider, teamed up with his Dubai race winning team mates and Carrera Cup super stars, Sean Edwards, Jeroen Bleekemolen and new for 2013 Nicki Thiim. 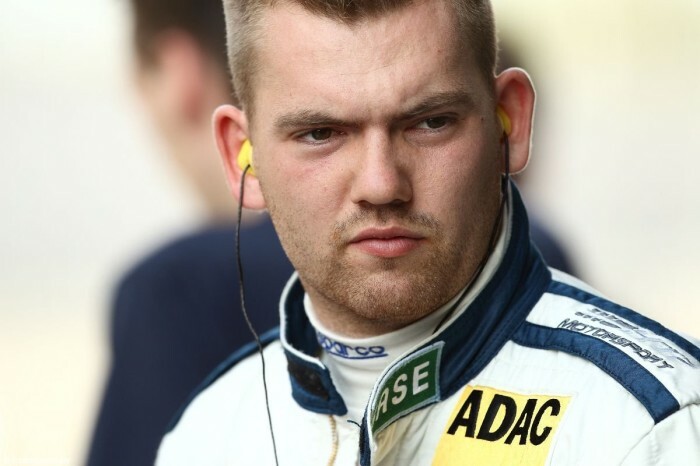 In car number 10, Andrii Lebed, Harri Proczyk and Dennis Rostek, making a second strong entry, joined Andreas Simonsen. For the third entry, sporting the number 63, Christian Bracke and 24-hour Nürburgring first timer, Khaled Al Qubaisi and their Pro driver, Daniel Keilwitz, joined Vimal Mehta. After a washout on the Friday practice sessions, Saturday saw the sun come out over the Eifel and all three cars breeze into the Top 40 qualifying sessions. Andreas Simonsen topped the time sheets in both Qualifying 1 and 2. With the order of the Top 40 qualifying being decided by lottery, it was to the misfortune of Sean Edwards in car number 9 that he not that is would have mattered anyhow as the car 9 would also have to serve a five grid penalty for a yellow flag infringement in qualifying 1, meaning that Sean would start the race in P11. For Simonsen in car 10, a fantastic lap saw them taking P9 against some of the best teams and drivers in GT racing. For Keilwitz in car 63, in his first race in the SLS a respectable P17. With the race starting unusually at 5pm on Sunday and the weather predicted 24 hours of rain, the teams were all happy to set off from the start line under dry conditions. However, for car 9 stating in P11 the challenge was going to be tough. With the Audi’s, Aston Martin and BMW steaming ahead from the start line, the Black Flacon number 9 was quickly losing time to the leaders and by the first pit stops already had a mountain to climb! Sadly for Simonsen in Car 10 after a great start, had contact with a SEAT and damaged the right rear axle. Limping back to the pits where the Black Falcon mechanics worked furiously to have the car back on track, having lost only 6 laps. A great job by the team, but sadly now putting a podium finish well out of reach. The drivers would now be fighting to keep some pride and get into the top 20! Meanwhile, Car 9 and 63 continued the battle on track. With Schneider at the wheel, the team moved in and out of the top 5 as the teams made their pit stops, and soon into early evening the rain started. By the time Bleekemolen took over the deluge had begun and cars were crashing off the track all over the place. Conditions continued to worsen with fog sitting on the track and soon after 11 pm the race organisers took the decision to temporarily stop the race. For car 9 this was a shame, as Bernd Schneider was now cutting his way back through the field to make up some to of the lost time from the opening stages of the race, the new Dunlop rain tyres, proving to be unbeatable in these conditions. However, this was to be cut short and the race would not start again until 8am the following day. During the break, the cars were quickly cleaned up and made ready for the restart, unusually giving the drivers and team members some time to sleep. However with the race clock still ticking, time was getting short for Black Falcon to get to the front. A driving stint that saw the team have their hearts in their mouths on many occasions. Soon Edwards took over and proved he too could be the fastest man on track. Car 63 in the hands of Nürburgring 24 hour first timer, Khaled Al Qubaisi taking the restart had crept its way into the top 20. 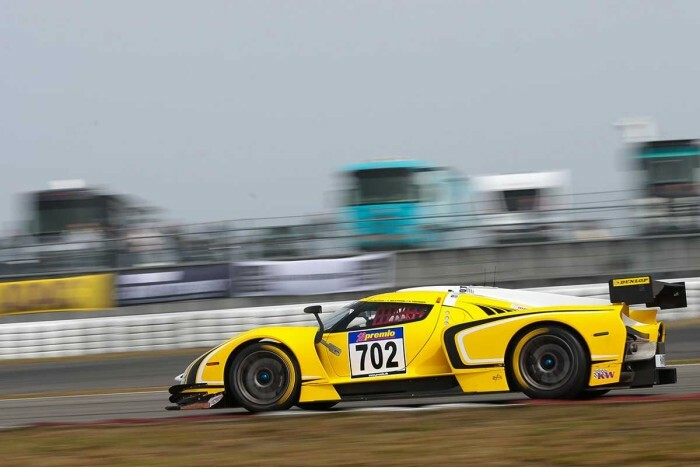 Vimal Mehta took over for a clean stint before handing the car over to Christian Bracke. Sadly for car 10, a technical issue saw the car stopping on track leaving no chance for a top 20 finish. The team did manage to get the car restarted and safely back into the pits. By midday on Monday, with the rain easing and the track beginning to dry, car 9 moved onto the superior Dunlop cut slick. Demonstrating the great set up, fantastic strategy and awesome driving skills, car 9 was soon leading the field. With careful planning and a little bit of luck the Black Falcon pit wall team chose a strategy that would allow them to make one less pit stop than their competitors. By the final stint with a four-minute lead, Sean Edwards was able to adopt a fuel saving mode and despite the hard charging Z4 from Marc VDS, Edwards was able to cruise to the finish line. Finally all five Black Falcon cars finished the 24h Nurburgring race, the two Cup Porsche finished in the upper places in the strong SP7 class. No scratches or dents, only tires, fuel and brakes were used by the Porsche drivers, which have done a real zero-mistake-job under extreme conditions. 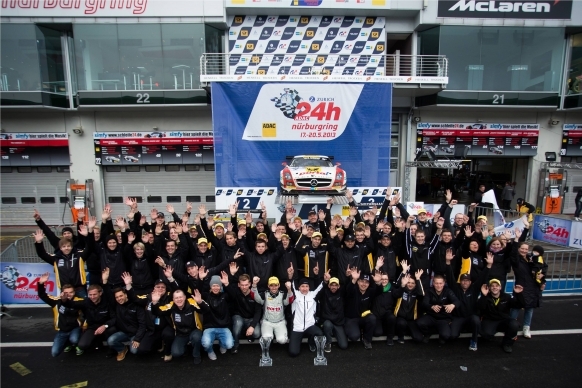 Winning the Nürburgring 24hrs has been the dream for all those involved with Black Falcon. The emotions ran high as this; the ultimate goal of winning was deservedly achieved. Giving Mercedes their first ever 24hr win at Nürburgring. A success like this is only possible, thanks to the hard work and dedication of the Black Falcon team. Most especially mechanics, but also, the strategic planning on the pit wall, the support from Dunlop, Bilstein, Pagid and of course AMG, their team, and the all dominating GT3 car they have built.